Non woven pre-felt in a beautifully soft and light merino wool and silk mix. 80% pure new merino wool, 20% finest Mulberry silk. 100g/m. The finest Flyfel-web. Merino wool mixed with grade A mulberry silk. A delight for Nuno felting. Well suited for filmy, yet still very robust felting projects, even when used in single-ply. 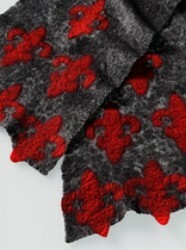 This extraordinary pre-felt allows for the creation of velvety surfaces with an almost metallic silk gloss. wosi = wool und silk.